If you live every day of your life as if you are on a wonderful journey through an endlessly fascinating, strange land -- you are. Our Exploring Conscious Travel and Ecotourism Guide is the 20+ year story of how tourism and conservation began to change themselves inside-out. This feature is regularly updated with feedback from travelers, community leaders, entrepreneurs and policy-makers. We share the stories of how locals and visitors are creating mutually beneficial relationships that deepen our understanding of the world. It's time to rethink, reflect, reimagine and rebuild on a number of levels at the same time. Wikification is gaining ground, so please keep an eye on the Planeta Wiki as we continue to push the envelope of collaborative writing and editing. A reminder: this guide is a work-in-progress. It would be good to refashion parts of this work into additional digital and analog formats. Suggestions are always welcome. Taking a trip? 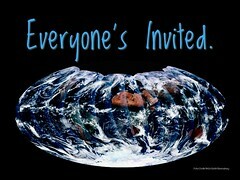 Consult our popular World Travel Directory. The term really doesn't matter -- ecotourism, responsible tourism, sustainable tourism -- whatever policymakers call it, this will never be THE solution for any particular desired outcome. Tourism in all its guises - from slow adventures to local travel - works in tandem with other cultural and economic forces and serve as a catalyst which supports sustainable practices, including greening trade and tourism, conserving wildlife and creating mutually beneficial relationships among locals and visitors. Specifics may vary, but the big picture doesn't -- responsible tourism is preferable to irresponsible tourism, ecotourism is preferable to un-ecotourism, local tourism is better than tourism that ignores the locals and sustainable tourism is, well, you get the idea. How is 'ecotourism' interpreted around the world? 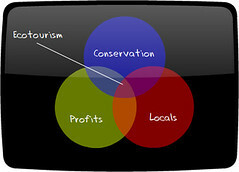 What are ecotourism's core goals? Can we design tourism that provides visitors and locals with choices and nudges us from poor decisions? Are we culturalizing commerce or commercializing culture?